Ambient maestro Kit Watkins returns to his evocative Thought Tones series with his second volume of unearthly ambient tone poems, this time exploring darker and mesmerizing themes that can only be described as 'epic'. And, incredibly, he may have even exceeded the first volume, both in depth and in scope. Where Volume 1 of the series was thoughtful and abstract, Thought Tones Volume 2 is powerful and commanding, with the perfect touch of delicate finish. This is no passive wallpaper ambience, folks; this is the kind of music that makes you sit right up and become part of the whole experience. And yet the music remains true to the original concept behind the series, which is to explore the kinds of abstract music that can be made by eschewing traditional instruments, forms, and conceits. Like the previous volume, each track is pure organic ambient goodness; and, like the previous volume, each track is both remarkably approachable (even to people who think they don't like abstract music), as well as utterly resilient to the ravages of time. Indeed, despite the fact that this album was originally released in 1992, the music in it today feels as ground breaking and potent as it did fifteen years ago. Clearly we at Earth Mantra are big fans of Kit Watkins, so you might be tempted to write off our descriptions of his work as being overly hyperbolic. If so, you do so at your own peril. 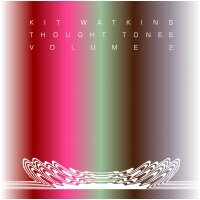 Be not deceived: Kit Watkins is truly one of the great ambient minds of all time, and Thought Tones Volume 2 is an essential example of what we are talking about. Download this album now, and you will hear exactly what we mean.